Bible Cartoons: Deuteronomy 1 - first cartoons: dappled or not?! Deuteronomy 1 - first cartoons: dappled or not?! 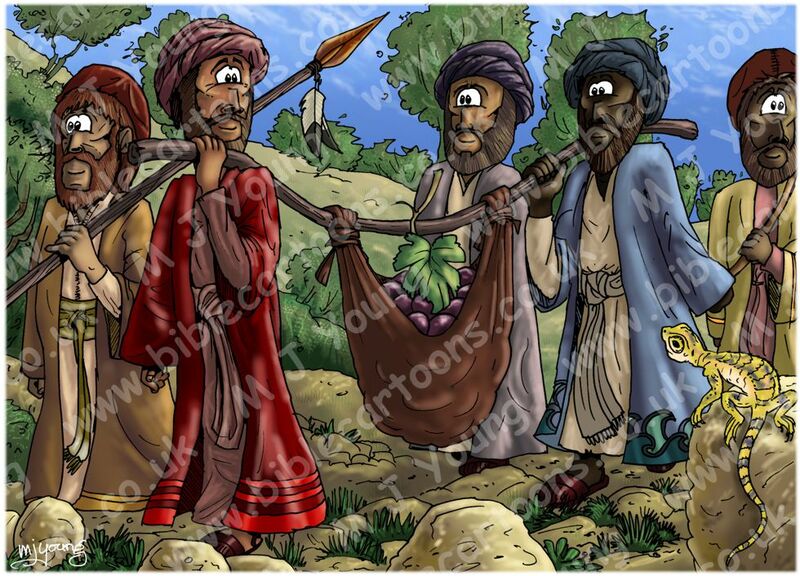 I’ve just uploaded the very first cartoon illustrations I’ve ever done for the Old Testament book Deuteronomy. 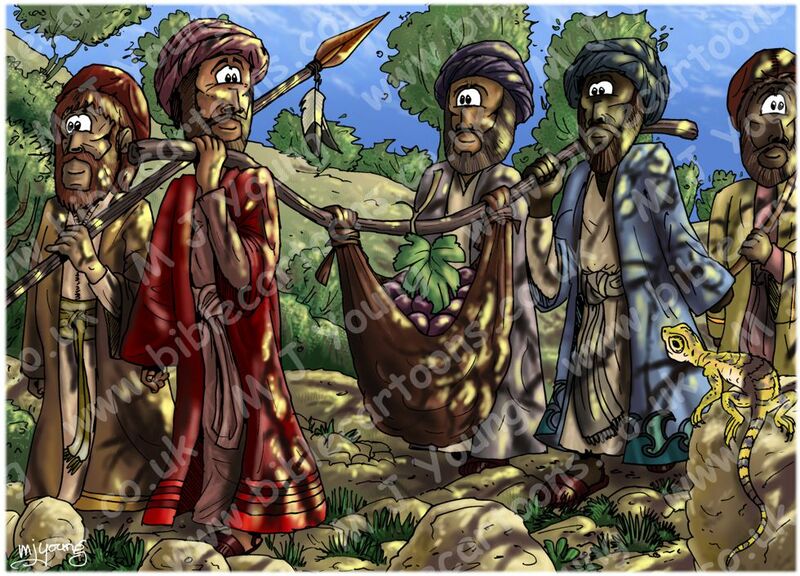 The scene shows 5 of the 12 spies walking through the valley of Eschol, a name which literally translates “bunch”, no doubt named after the enormous bunch of grapes the spies took to show Moses & the rest of the Hebrew people, who were, at this time, camped in the territory of Moab, east the Jordan river. After colouring the scene with shadows & highlights, I added a new element – dappled light. That is light that comes through unseen trees, on the right of the scene. The effect is to throw strong shadows across the figures, with bright splashes of sunshine between the dark shadow areas. I was pleased with the result & this is quite a novel lighting technique for me. However, it occurred to me that the scene might be harder to interpret, especially when viewed on a small screen (such as on a laptop) or when a customer printed it out. Therefore I wondered if I should create a second, un-dappled version, which just has my more usual lighting. Consultation with my wife & her expert opinion confirmed this to be a good course of action! So I have added 2 versions of the scene to the Bible Cartoon’s collection, both of which can be seen below, for comparison. Which one do you prefer? Please leave me a comment.